Many shooters struggle with guns that are the wrong size for them. Here's how to find your perfect fit and feel. I just got back from the range, where I instructed a small group of armed guards who were taking part in their first live-fire exercise to determine their fitness to carry guns on duty. A pair of these gents carried small autoloaders. One of them was a medium-size adult, the other easily a full size larger. While they had some challenges unrelated to the size of the gun, I noted their difficulties in gun handling. Their hands were just too big for the guns. I recommended something larger for each of them. That's in stark contrast to a previous situation I've had to confront for many years while instructing firearms in an agency where the issued handguns didn't fit the hands of a significant number of officers. The handguns were steel-frame .45s, double action the first shot, single action for the remaining rounds. The guns were durable, accurate and reliable, but many of us just couldn't make a fast hit out of the holster--the grip was too deep front to back and the trigger reach in double action was way too long. Various dimensions of the hand affect handgun fit. It's not just long fingers or width of the palm. And that, in a nutshell, illustrates the problem of gun fit. There's no blanket solution, no silver bullet, because of the variety of hand sizes, grip sizes, gun types and situations in which the gun might be used. Back in the day, we carried round guns instead of square ones. Most revolvers were supplied with either wood panel Magna grips on each side of the grip straps or with premium "target" stocks--thicker side to side and bottom to top, and widest where the human hand has the smallest fingers. What was our response to these two ill-fitting designs? We changed stocks. The lucky people with small hands--like mine--could take the smaller Magna grips and add a grip adapter to fill the area between the trigger guard and the front of the grip frame. When it comes to handgun fit, everyone assumes you're talking about grips, but stocks aren't everything. Different size revolver frames can fit certain shooters better than others. Big cylinders take big speedloaders and, for some of us, are slower to manipulate. Tasks related to making the gun work, like reloading, can be compromised if the gun is too big or too small. If you are comfortable carrying and using a revolver, life is good. For one thing, they're available in a wide range of gun sizes. Just look at the frame offerings from Smith & Wesson alone, not to mention the variation in size among different manufacturers. And if there's a gun that you really want but doesn't fit you exactly right, great-fitting alternative stocks are available from Hogue, Eagle Grip, Ajax, Herrett's Stocks and Brownell's. Semiautos are a different animal. With them, the gripping surface of the frame is dictated by the size of its magazine, which is, in turn, dictated by the size of the cartridge for which the gun is chambered and the capacity of the magazine. The 1911 is an example of an older design with excellent ergonomics. The frame and trigger can be easily changed to fit the shooter. The original 1911 had a flat mainspring housing and a long trigger. The 1911A1 went to an arched mainspring housing and short trigger. This Taurus 24/7 Pro is still just a bit large for this woman's hand. With the pad of her trigger finger on the face of the trigger, she's unable to get a proper grip. If neither the original nor the A1 work for a shooter, messing around with combinations (arched housing and long trigger or flat housing and short trigger) will give most users a good fit. Short stock screw bushings, shortened stock screws and very thin stocks are also available to minimize the circumference of the gun. Most double-action autos--properly called "trigger cocking" actions--have triggers with long reaches because they have to travel a long way to fully activate the hammer. So trigger reach is a big problem with this design, as it is with double-action revolvers. S&W "target" stocks on the Model 29 (left) are too big for most hands. The custom stocks on the S&W Highway Patrolman (right) are thinner, fore and aft and side to side. This problem is enhanced with autos that utilize double-stack magazines. These high-capacity autos are often quite thick with rounded surfaces. And if their stocks are made of wood, it makes the whole affair even bigger. The feel of such double-stack, double-action autos is akin to a new bar of soap. Just as with revolvers, when deciding on a semiauto you should first look at the overall gun for proper fit. And you'll want to try out as many models as possible to find one you can work with. Fortunately, when it comes to today's designs, there's a new paradigm. The firearms industry realizes that we aren't all the same size, and companies have spent considerable amounts of money and time ensuring their flagship guns can be adapted to different shooters--typically through swapping out different sizes of backstraps or grip thicknesses. That's a simple check, requiring only a safe backstop to test the gun fit. Others have measured the circumference of the gripping surface. I always used a cloth tape from the left side of the trigger at the front, around the left side of the (unloaded!) gun high on the backstrap (where your hand should be) and around to the right side of the trigger. The U.S. military service pistol, the M9, measured in at about seven inches around. The previous U.S. pistol, the 1911, measures just under 6½ inches with a long trigger. While a half inch doesn't sound like much, it makes a big difference. There are lots of variables beside simple linear measurements. The thickness of the hand and its digits makes a difference. My trigger finger drags on the frame of the Glock. I can't do anything short of modifying the gun to resolve that. Over a trial of several thousand rounds, I learned to make do. Many shooters won't do that, and most agencies won't allow that kind of break-in. Watch for the index finger rubbing the side of the frame during dry firing. Also be aware of your finger dragging on the inside of the trigger guard. Short, thick fingers can wreck trigger control. The HK P2000 comes with four backstraps, allowing shooters to adjust for best fit. A last quick test for grip fit is to see if the pad of the thumb of the shooting hand reaches the tip of the middle finger on the left side of the gun (for a right-handed shooter). If it doesn't reach, preferably touching somewhere between the tip of the thumb and the distal joint, it's likely not a good fit. If it does reach and the feel is right, you are there. If you have a baseline of skill with one weapon system, you can check gun fit of a new handgun compared to your customary gun by running a few drills. 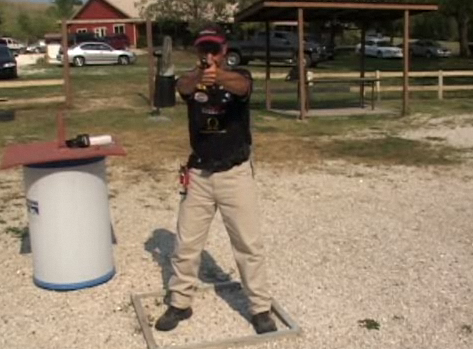 One I like is the School Drill from the Gunsite 250 Defensive Pistol Course. I take the drill back to 15 yards. I follow up with the Arizona Daytime Qualification Course fired Maricopa County style. Both drills are described in the accompanying charts. 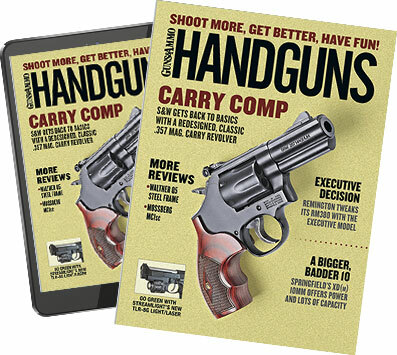 Unless you are very familiar with these drills, use the times as guidelines only; all you really want to do is run the exercises to get a feel for the handgun. Starting position: Holstered with gun loaded and charged. USPSA-type target. 3 yards, one round to head, 1.5 sec. 5 yards, two rounds to body, 1.5 sec. 7 yards, two rounds to body, 1.5 sec. 10 yards, two rounds to body, 2 sec. 15 yards, two rounds to body, standing to kneeling, 3.5 sec. 25 yards, two rounds to body, standing to prone, 7 sec. You are looking for ease of reach to necessary controls, gun fit to the hand (does it feel right? ), the speed at which you make the first hit from the holster, and how well you personally work with the gun. Do some dry-fire practice on the range. The first thing to check is reach to the trigger, followed by reach to slide stop and reach to the magazine release button. You also want to see how the strength of the recoil spring affects your ability to rack the slide surely easily while maintaining a firing grip. Find your ideal grip on the gun. Holster the gun and replicate the grip with the gun in the holster. Ensure you can get a firing grip on the gun while it is holstered. Which gun is best for you? Try several. Go to a range that rents guns or find a friend that's got a model you'd like to try. Trying is the only sure way to find the handgun that fits. Starting position: Ready position or holstered with gun loaded and charged. NRA TQ-21 target. 1. 25 yards, 2 hits from holstered, 6 sec. 1. 3 yards, 3 hits from holster (2 center-mass, 1 head), strong hand only, 4 sec. 2. 3 yards, 3 hits from ready (2CM, 1 head), strong hand only, 3 sec. 3. 3 yards, 3 hits from holster (2CM, 1 head), two hands, 4 sec. 4. 3 yards, 3 hits from ready (2CM, 1 head), two hands, 3 sec. 1.7 yards, 3 hits from holster, 4 sec. 2. 7 yards, 6 hits from ready (3 hits, tactical reload, 3 hits), 15 sec. 3. 7 yards, 5 hits from ready, (3 hits, empty reload, 2 hits), 12 sec. 1. 15 yards, 3 hits from holster, 5 sec. 2. 15 yards, 3 hits from ready, 4 sec.